cavok wrote: To do an intercept (i mean for Air policing), you need to catch ip with your target. As simple as that. On a small country, considering the huge transsonic delays etc. I'm not sure any F-35 B/C can do any interception. Maybe F-35A, but it will be hard! gta4 instead of saying nonsense, why not reading Pete Collins article "Rampant Rafale", the number 1500 is directly from there. For a small country, differences in time to being on station or time to intercept between 1.6 Mach and 1.8 Mach are negligible -- tactically meaningless, not to mention staying within one's own geographic boundaries. Also, depending on the nation, and the intercept geometry, there is probably an airfield somewhere from which aircraft can be launched so you are NOT in a tail chase. As an aside, I find your statement "I'm not sure any F-35 B/C can do any interception" to be absurd to the point of unbelievable, and your credibility has dropped dramatically in my view. Do not MOST, if not all nations, have rather stringent regulations regulating or prohibiting supersonic flight over populated areas? You seem to be arguing that maximum, top-end Mach is required for the air policing mission. (Earlier you seemed to argue it was a requirement for the interception mission, but you appear not to be pushing that argument as much anymore?) As such, I do not believe top-end supersonic speed is necessary for air policing. Even if I accepted your (apparent) premise that top end Mach is a requirement for air policing, for a "smaller" nation, where distances are reduced, the difference in time between an aircraft arriving on scene at 1.8 Mach and 1.6 Mach will be small, on the order of tens of seconds to a minute or two. Is that significant? I don't know, I don't have the tactical experience to judge. My opinion is that IS not a discerning factor. On the other hand, the ability to carry LOTS of gas for an air policing mission would appear to be relevant. You may argue that the Rafale can carry three external gas cans. OK, but what then of it's "vaunted" acceleration? And time to climb etc. OK, let's set the acceleration issue aside. Does the mission require LO? If so, the Rafale is decidedly inferior to the F-35. (Can there be any argument here?) Why LO? Well, let me re-phrase... does the air policing mission require one to be able to sneak up on, and appear suddenly beside the intercepted aircraft in a sudden and unexpected manner? If so, then the combination of low observability with LPI radar AND unmatched situational awareness (not to mention seamless sensor fusion of radar, DAS, and EOTS) give the F-35 a distinct advantage at pulling a Raptor on the target aircraft. If LO is notrequired, then bags of gas could eventually be hung on an F-35 (that is, if the powers-that-be ever decide they really really need all that extra gas). I'm sorry, but I just don't buy your "need to catch up with the target" argument. What target needs "catching up with"? How fast is the target going? Subsonic, or supersonic? If subsonic, how is an F-35 any different from a Rafale in catching a subsonic target at subsonic speed? Fuel burn, and fuel carried seem to be more appropos metrics. If the target is supersonic... are we really conducting an air policing mission at this point? Are we not at the point of trying to determine if the target is hostile and take it out? Is there really any questions that an unidentified, supersonic target... unresponsive, non-communicating... isn't a threat? Isn't this a job for an AIM-120, Meteor, or Patriot? In this regard, I do not see how an F-35 is "inferior" to any existing aircraft, save an F-22. And even there, the superior sensor fusion of an F-35 may be a better choice than an F-22 from a "is it friend-or-foe" perspective. As the eagle flies, it’s 153 miles from Cape Cod’s Otis Air National Guard Base to New York City. Duffy and Nash cruised at a supersonic Mach 1.2. “We got there as fast as we could,” Nash, now a lieutenant colonel with the Air Guard's 104th Fighter Wing at Barnes Regional Airport in Westfield, recalled recently. At 8:46, just at the time the first tower was hit, Nash and Duffy were ordered to start their engines, a process that takes about five minutes. They were airborne by 8:53, and without permission to break the speed of sound, Duffy started going about Mach 1.4 -- more than 1,000 miles per hour -- toward John F. Kennedy International Airport. ''We had no idea that anything was transpiring like it was," Duffy said. Some critics have questioned why they did not arrive sooner. Duffy and Nash were flying F-15 Eagles that were built in 1977. In their prime, the planes can go Mach 2.5; they could have been to New York in less than 10 minutes. Because of their age and the three large fuel tanks they were carrying, though, the planes couldn't attain that speed, both pilots said. So even here, a real-life "intercept" or "air policing" mission, two Eagles went buster to either 1.2 or 1.4 Mach. Sounds like the F-35 could have carried out this mission easily. Arguing against the F-35 is almost pointless. It's like arguing against that better looking athlete, who happens to be the smartest kid in school as well. No matter what you say, he replies, "Anything you can do, I can do better." Well, until his big brother, the F-22 shows up. I find myself returning to that general's quote: "The best air-to-air fighter in the world is the F-35, except for the F-22. The best strike fighter in the world is the F-22, except for the F-35." I was precisely thinking about switzeland and Liner interception. Not every country have very long distance warning systems. Even so, hi jacking a plane and modifying its path... Not as easy a task as one could think. And yes for intercepting, the EF is probably superior to Rafale. cavok wrote: I was precisely thinking about switzeland and Liner interception. Not every country have very long distance warning systems. I say the opposite: Every developed country which have standing armies (in this case standing Air Forces) and even most who don't, have very long distance warning/radar systems. For example how do think that ATCs (Air Traffic Controllers) in all those countries can control civilian air traffic? 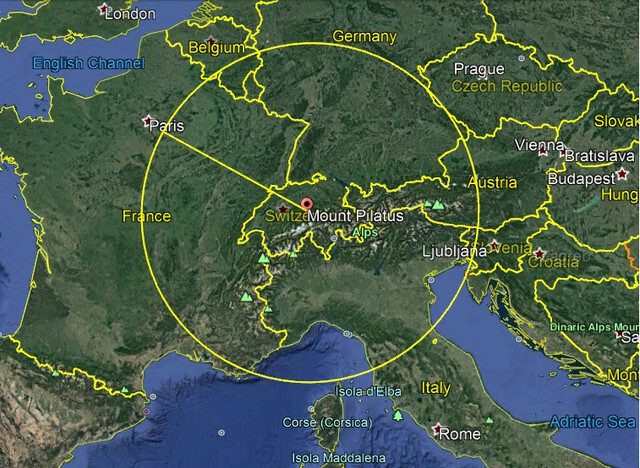 And speaking of Switzerland, yes it has a very long distance warning/radar system which is used for both by civilians and military alike. That system is called FLORAKO and there are in Switzerland four radar sites which belong to that system. One of the radars used by that system is called Master-T which has a maximum detection range of 440 kilometers. Interesting chart that you shared in this post of yours. However to be fair in terms of TWR comparison one must compare with a equivalent fuel load. For example the F-35 can go much farther (has a much longer range) with 1/4 of its fuel capacity compared to the Rafale with also 1/4 of its fuel capacity. So in order to have a fair comparison between the F-35 and the Rafale in terms of TWR both aircraft should have a fuel loadout which grants both aircraft the same or at least a very similar range (for example a fuel loadout that gives the Rafale a range of 300 nm and a fuel loadout that gives the F-35 also a range of 300 nm). And here the F-35 will even have a better TWR than the Rafale (look at the values that I previously posted). "Operational limitations" does not equal "Maximum speed". Since that's the same thing 1.6M means for the F-35A/B at least too. Damn! Now we learn the French navy can conduct NEITHER air-to-air intercepts NOR air policing missions! Last edited by optimist on 12 Oct 2017, 02:53, edited 2 times in total. Was it Chip Berke who basically said that flying faster against a 5Gen aircraft means that one just dies faster? popcorn wrote: Was it Chip Berke who basically said that flying faster against a 5Gen aircraft means that one just dies faster? Well, maybe not if you are running away. Of course, not knowing where they are... you may be running at 1.8 Mach towards that 5th gen with the evil grin. optimist wrote: You do know that gen 4 can't crack M1 with tanks and bombs don't you? Cavok has stated several times that a Rafale can (and has) hit 1.8 Mach with three external tanks. Pretty sure it wasn't carrying bombs. I don't recall if he claimed (or stated) if it had any AAMs on board. I'm sure he'll pop in here to set the Rafale record straight. just for fun,the f-35 has been flown at 750kts, I'll leave it to someone to work out what Mach speed would be around 33k , my maths and slide rule must be wrong, or I'm leaving out some drag coefficient and we don't know the alt the knots start to fall off..
Amazing how one second it goes mach 2, then the next mach 1.8.with EFTs, now it's operationally limited to mach 1.6. It's dropping .2 every time I check on this thread!